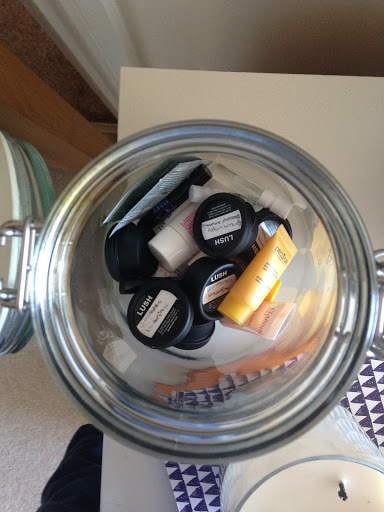 This week I thought I’d show you a little (well maybe not little..) haul of what I recently bought at lush. To make myself feel better I’m going to say this is a collective haul, if an internet order and a store visit in the space of one week counts as collective. Lush are know for their bath bombs but they actually have a lot of other products with great reputations that I’ve been wanting to try out for a while. I haven’t tried most of these products yet so can only give my first impressions, I’m sure you will be seeing them in favourites and routine blogposts in the near future. Marilyn – A blonde hair treatment which I wanted to try out as my hair feels quite damaged at the moment and I would like to hydrate it for summer. It has camomile in it to flatten your hair at the roots to give it a top to tail shine, lemon to bring out your blonde and lots of different oils to nourish your hair. Let The Good Times Roll – I’ve tried angels on bare skin in the past and I liked how it left my skin feeling moisturised after using it but I felt like it wasn’t abrasive enough. Let the good times roll is the same consistency but the lovely woman in lush explained to me that this one is more exfoliating. This is so quirky, it has popcorn in it!! Volcano – This is a foot mask, yes you heard me correctly, not a face mask… A foot mask. The “how to use” says you put it on your feet, wrap your feet in plastic bags and leave for 20 minutes. A foot mask, wrapping your feet in plastic bags, this sounds a bit weird to me.. I thought this had a cool concept and I’m hoping it works miracle wonders on my feet in time for summer. Eau Roma Water – My current toner recently ran out and I wanted to try something new as it wasn’t anything special that I felt like I needed to rush out and repurchase. First of all, this is lavender scented, my absolute favourite smell. Aside from the smell, lavender is hydrating and soothes redness/uneven skin tone. I’m very optimistic about whether toners actually do anything or not but I really enjoy this step in my skincare routine now I’m using this. Bohemian – I never actually use solid blocks of soap but they’re my favourite thing to put in wardrobes and sock/underwear draws. Until I bought bohemian, egg nog (I think that is what it was called) from lush’s Christmas collection was in the bottom of my wardrobe, nearly 6 months after Christmas oh dear. Bohemian is lemon scented so leaves a subtle yet fresh scent lingering on my clothes. I’ve never tried any of these things from lush as I decided to stray away from my usual favourites and try something new like I did with the other products. *I also purchased big blue but I couldn’t wait until the blogpost to use it, hehe*. May day – May day is lush’s product to raise funds to fight against animal testing. We all know that lush feel very strongly about animal testing and their ethics are what draw a lot of people to their brand. May day as you can tell in the name was a product for the month of May so is no longer available online but I did buy another one in store as a present at the beginning of June so I’m not sure if they’re possibly still available. You’ve been mangoed – I love mango, the food and the scent so I knew I would love this. I’ve only ever had two bath melts from lush and they both left my skin feeling so silky and moisturised. I know this is going to be so nourishing as when I got it out the box, the heat from my fingers started to melt it straight away. I also think this will be really nice for a morning bath as its a sweet but a refreshing scent to start the day. Brightside – Bubble bars are very affordable as the amount of times you can use them is unbelievable as the smallest crumbling produces masses of bubbles. This has tangerine oil in which will be really refreshing for the summer, I sense a citrusy theme occurring with the products I chose. Mmmelting Marshmallow Moment – Tanya Burr said in one of her vlogs that this was her favourite bath product from lush so I thought it was about time I tested the craze for myself. This is quite expensive for a one use product so I really hope it lives up to my expectations. Again, this is a bath melt which I think will be really good to keep my skin hydrated when I’m shaving frequently during summer. Honey Bee – First of all, this is adorable. It (obviously) has honey in which is a natural moisturiser and antiseptic which I imagine could be really good if I have sunburn. Again this has orange oil in in and it has aloe vera in which is also really good for sunburn. Also, how lovely are the people at lush, they gave me some samples of products to try that I liked the look of. Big – This is a shampoo and after one wash, I fell in love. It’s like rubbing dry salt in your hair until it mixes with water and lathers up, it just leaves my hair without that newly washed feeling where it’s impossible to do anything with. I’m going to ask for this for my birthday as I really love it and I dread to think of when my samples run out. Dreamwash – This is a shower smoothie, it has camomile in it which soothes the skin. I often shower twice a day so in the mornings when I sometimes can’t be bothered to moisturise, it’s nice to use this as my skin doesn’t dry out during the day. D’Fluff – The scent of this shaving cream is absolutely amazing, it smells of fresh and sweet strawberries. I like the fact that this is pink/red as it means you can see where you have shaved so you don’t have strips of unshaved hair.